When it comes to being geeky, there are few things that can top music being made by old floppy drives or amusing references to Valve’s hit game, Portal... except, maybe, when old floppy drives are playing music from Portal. You have to admit, that pretty much tops everything else. 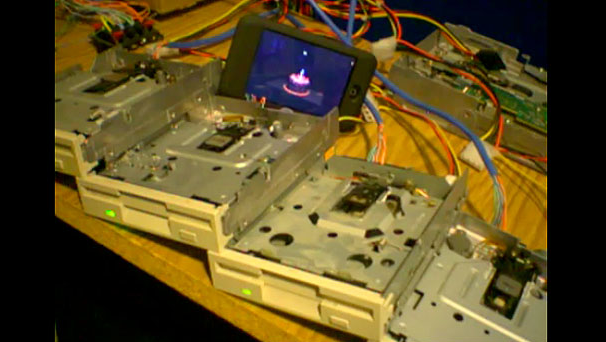 Observe: YouTube user Sammy1Am assembles four floppy drives (hereby referred to as the Floppy Drive Quartet for the purposes of this article) join together to grind out Still Alive, the song everyone will remember from the Portal series. Using the buzzing and whirring sounds (that once upon a time used to drive us nuts), they bang out melodies and harmonies to the familiar tune. The irony isn’t lost on us that the Floppy Drive Quartet, using technology that’s completely fallen off the tech radar over the last decade, is performing “Still Alive”. It’d be kind of sad if it wasn’t so awesome.